Good hearing is very beneficial to the development of language. Baby Body Signs states, “…babies learn to speak…almost effortlessly if all the components of hearing…are in place” (page 78). The ears aren’t only about hearing, though. Let’s discuss some key things to watch for with baby ears. These are just points I found most important to highlight from this book–there is more that I do not discuss. The thing to really take note of is that if your baby has an ear abnormality, there is a chance she will also have kidney problems since they form at the same time. If your baby has abnormalities to her ear, bring it up to her pedi. Baby Body Signs states a baby with ear abnormalities should also have an ultrasound to check kidneys. Parents are typically the ones to first notice a hearing problem with their child. Just because a child responds to sound doesn’t mean there are no hearing issues. Sometimes a child is responding to a noise he can hear, vibrations, or movement. If your baby doesn’t seem to respond to your voice or is having difficulty learning to talk, you might want to have it looked at. “…early recognition of a hearing problem can lead to effective treatment” (page 83). My cousin has a boy 6 weeks younger than Brayden. He is her fifth child. I can’t remember the exact age—I think it was about two–they realized he had some hearing problems. Up to that point, he did not talk and he apparently threw a lot of tantrums. They were able to correct the problems and he quickly caught up and today you would never know there was ever an issue. Most hearing problems are present at birth, but there are many children who have an infection or injury that lead to hearing loss. Even some toys can cause hearing loss (see page 86). McKenna has had two double ear infections back to back in the last two months. The first time, it got very bad before I realized what it was. She was fussy. She had trouble with balance (which I only realized after reading this book–I just thought she was being clumsy). The thing that got me to act was she was not eating and she woke up crying in the night. We took her to the doctor and got her some antibiotics and she was back to her old self. A few weeks later, she suddenly started getting fussy–grumpy and impatient. She didn’t have any other signs, but I was being hyper vigilant and took her right to the doctor and yes, she had a double ear infection again. If your child has repeat ear infections, your doctor might suggest tubes. Tomorrow, McKenna will be checked to see if she has an infection again as a precaution. If she does, we will explore tubes. My doctor recommends tubes if your child has three infections in three months. This book doesn’t talk about it, but here is what I understand so far. The tube is put in to help prevent infection. It is does in an out-patient surgery under general anesthesia. While tubes are in, you need to limit water in ears. 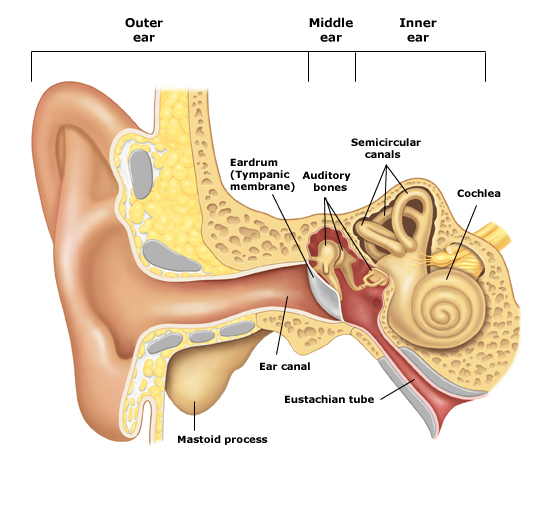 Tubes stay in the ears for 6-12 months and usually fall out on their own. Some children stuff things in ears. Some things will come out on their own, but you should not try to remove it yourself. See a doctor for help. You don’t wan to damage ear tissue. Next Post How I Do It Series: What I Learned From You! Great timing to read this post. All three of my kids have been sick this past week. My son ended up having a fibrile seizure. We then discovered that he had a double ear infection. He's two and doesn't talk so he couldn't tell us he has been in pain. The only thing that I can see looking back is he suddenly hated having his hair washed. Thanks for writing this. I'll know better what to look for! Both of my children have dealt with chronic ear infections. After my littlest one had an infection for an entire month and no relief though put on several rounds of strong antibiotics, we went to the ENT and scheduled her for surgery to get tubes. I felt there was no other way at the time. We ended up having to postpone the surgery due to some insurance changes taking place at the beginning of the year. But, then she started to improve. And we started to explore a few other options. I started taking her to a chiropractor that sees a lot of kids for ear infections. Then she got another cold…and was up 3 times in the night and pulling on her ear, and I just knew that we were going to have to start another round of antibiotics. Anyway, I took her to the chiropractor 2 days in a row and by the next night she slept 12.5 hours straight through (something she has not done yet). She is doing great and has recovered quickly from her cold. I don't know 100% if it is because of chiropractic care. But, I do know that up until now, she just could not beat the infections and now she is. We may not get tubes after all! My 3rd child, a boy, has had chronic infections for over a year. Believe it or not, he's had 12 in a year 🙁 He has tubes (since April) and still gets occasional infections but at least the tubes allow the pus and infection to be released! It's very important to be vigilant about hearing problems. J was 12 months and had a few words, then he stopped talking when all the infections started. We estimate that he lost hearing for almost 5 months. Now he has developmental delays, speech language delays, but we are hopeful for the future. He has a therapist that is helping him and Im so grateful! My son doesn't have ear infections but after reading this post I thought about another option as I can't imagine how scary it would be to have your child have cronic ear infections. When my son was born he had latching on issues so we went to a Craniosacral therapist and it made all the difference instantly. I googled Craniosacral therapy and ear infections and got a lot of results back. Just thought I'd share that Craniosacral therapy might be something to consider. My son just got over his first ear infection. He didn't have a fever, and other than eating a little less than usual nothing really seemed wrong. We were decorating for Christmas and I rung some jingle bells near him and he started shrieking. At first I thought he was scared of them, but then he had the same reaction to the sound of a plastic grocery bag rustling. I knew something was up because that had never bothered him before. My mom suggested he may have an ear ache, so we went to the doctor and it turned out to be true. Sensitivity to noise is not a symptom I've ever seen listed for ear infections, but in his case he definitly was pained by certain noises. Just something for other mom's to watch for. Thank you everyone for your comments!Diedre, I haven't ever heard that either!